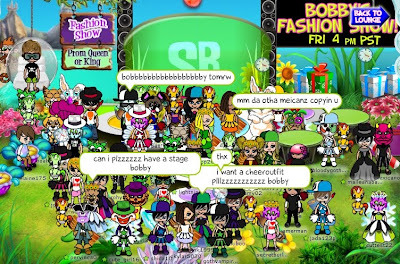 The Fashion Show is now Bobby's trademark - everyone knows about it, and people can't get enough... Today, Bobby had three different themes for dress up - Purple, Shorts and Skirts, and Face Masks. The winner of the first round won a trampoline, the winner of the next one got a dance floor, and the third winner received the big prize - a Fashion Show Stage!!! Pretty nice gifts - wouldn't you agree? People kept asking for more after the last one was over, but Bobby had to go... Fortunately, he promised to have another party very soon :) Will you be there next time?